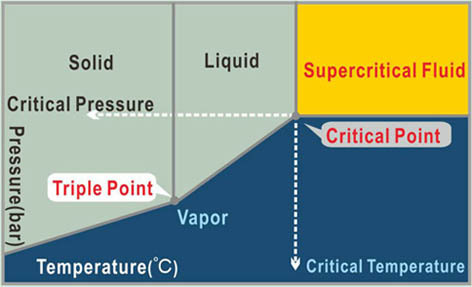 Usually only have a material gas, solid, liquid three-phase, the so-called "supercritical fluid" is the means: When the fluid temperature and pressure to achieve a "specific points", gas, liquid two-phase of the same density tended to , And merged into one uniform of the state, such a "specific points" of the fluid is called the critical point. When one of the fluid temperature and pressure are beyond the critical point to achieve the super-critical state, at this time of the fluid that is defined as overweight supercritical fluid '. Once the material into the supercritical fluid state, showed that between liquid and gaseous between the stability and special phase, can not be entirely classified as a liquid or gas of the areas, but also have the characteristics of the two substances. On the one hand, that is, with low surface tension, Di Nianduo, and the proliferation of high gas properties, on the other hand, but also has high dissolved, and high density of the liquid, therefore, particularly in control of the solvents like characteristics, making it a Organic and water-based solvents of the best environmental alternatives. 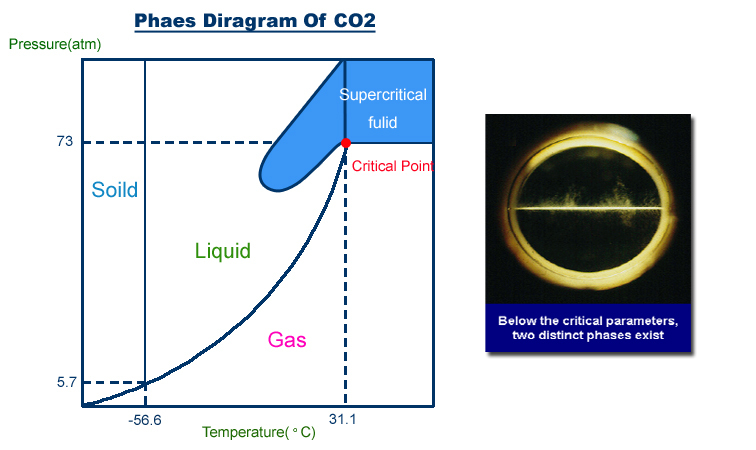 Basically, a variety of gases, including water can be as supercritical fluid medium but on the CO2 is the most commonly used. CO2 is mainly due to close at room temperature and normal atmospheric pressure conditions, can easily reach supercritical control point, therefore, become carbon dioxide supercritical fluid technology use the best medium. ※ trading on the acquisition, to facilitate cost, safe! ※ trading on the use of recycling. Reduce-energy conservation and reduce pollution; Reuse-repeated, repeated use; Recycle-sustainable resources, recycling. Carbon dioxide is in fact industrial by-products, such as the fermentation industry, the petrochemical industry in the process will have a high concentration of carbon dioxide, the collection of purified, liquefied compressed can be stored after use. To facilitate the cost can be substantial acquisition, will not be limited petrochemical energy crisis. Carbon dioxide in the natural world everywhere, beverages, soft drinks and human metabolism is natural there are, do not damage the environment heterogeneity of intrusive interference. Will not adversely affect the environment environmental waste. Is not Ranxing, no explosive, non-corrosive, chemical stability, non-toxic; does not need to meet fire, explosion or anti-corrosion of special protective equipment. 31.1 ℃ temperature temporary sector, so the selective application of the substantial increase in solute and can not avoid the objects of high temperature heat damage. Very easily and can be completely separate and solute, the solute and solvent that is easy to accept, without question residual reserves. Can be conducted at low temperature extraction, will not damage the heat sensitive material. 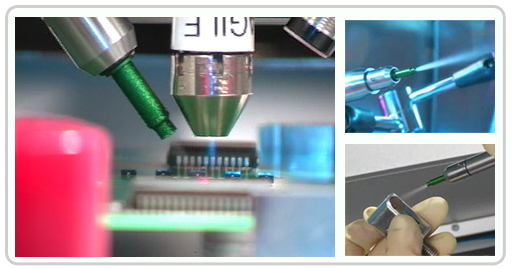 Optoelectronic semiconductor industry including the process of photoresist coating, developing and etching, photoresist stripping, cleaning, drying, metal deposition, etc., can be found in liquid or supercritical CO2 in the media complete, as a revolutionary production of green technology . The future, supercritical CO2 technology will be great potential, take into account environmental, cost and technical advantages, in the semiconductor industry technology to become widespread. However, supercritical fluid in the semiconductor industry is not limited to this application, such as supercritical water oxidation (SCWO) technology in toxic emissions / waste water treatment, liquid CO2 dry cleaning dust-free clothing, etc., there are unlimited potential and applications to be developed. Supercritical CO2 cleaning method is suitable for cleaning precision, tiny, tiny holes, the complex geometry of the workpiece, the supercritical CO2 low surface tension, making it easy to infiltrate into the nano-deep hole, slit, to hide After the dissolution of the dirt out, because under normal pressure at normal temperature gaseous CO2 to exist, it would not have finished cleaning residual phenomenon, a dry cleaning process. Supercritical CO2 extraction apply to all kinds of herbs, functional foods and extraction of essential oils and other products. Carbon dioxide gas can inhibit bacterial growth results, and supercritical CO2 permeable through the bacterial cell wall, and water with a low pH of carbonated, blocking the bacterial metabolism and death. Therefore supercritical CO2 cleaning method has been used to clean the space with satellites or landing craft and other components, to ensure no body was taken to outer space life. In addition, not suitable for high-temperature sterilization of biodegradable materials and medical equipment such as endoscopy, the pacemaker, hemodialysis tubes, urinary catheter, the human implants, and so on, can by supercritical CO2 cleaning and washing at the same time sterilization The purpose of the net. Use of supercritical carbon dioxide fluid dyes into fiber will achieve the purpose of staining. Supercritical CO2 extraction means CO2 goes to a supercritical phase after pressurization and heating temperature above critical points. CO2 at supercritical phase have solubility powers similar to liquid organic solvents, but with higher diffusivities, higher transfer efficiency, lower viscosities, and lower surface tension. With advantages of non-toxic, colorless, odorless, incombustibility, non-photochemical reaction, eco-friendly and easy recycling, CO2 is now considered as the best solvent for Supercritical Fluid Extraction technology. Supercritical CO2 extraction has no disadvantages of traditional extraction method. Ex, the biological activity is easy to be damaged in high-temperature distillation extraction, the organic solvent left in solvent extraction will influence the purity of extract, the aroma of esters is easy to vanish away in expression extraction. Supercritical CO2 extraction can extract high purity natural compounds easily. There is no solvent residues and little thermal degradation of sensitive compounds will occur. Separation and purification of totally natural and healthy compounds can also be achieved. 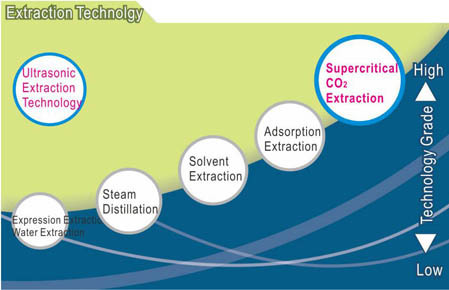 Supercritical CO2 extraction is the green and epoch-making technology today and tomorrow. ●Low temperatures extraction condition which result in less degradation of thermally-labile components in the extracts. ●No solvent residue in the extract. This means lower operating costs for clean-up and the reduction in post-processing steps. ● Non-toxic, high safety degree, non-flammable, non-explosive. ●Selective extraction by manipulating the operating conditions (temperature, pressure…). According to different conditions of pressure and temperature control, high-density carbon dioxide fluid application technology (DPCO2), in addition to the supercritical flow Body Wash application, there are major technical wash liquid carbon dioxide (LCO2), solid carbon dioxide Applied Technology (CO2-Snow ) And plasma technology Wash (CO2-Plasma). Wash the carbon dioxide technology can effectively deal with the following material on the surface wash, and remove pollutants. The higher the dissolution of the liquid state with supercritical carbon dioxide, the higher the density, the dissolution of the higher-quality capacity also increases. Have a high mobility, more easily into the normal liquid can not be infiltrated by the subtle seam, thereby achieving more depth. More detail cleaning. Low surface tension, making it vulnerable to infiltration of various tiny pores, and in-depth nano-deep hole, slit, smooth the dirt to hide out after the dissolution, therefore, very suitable for all types of precision, Tiny, tiny holes, and the complex geometry of the workpiece cleansing treatment. As liquid CO2 has demonstrated excellent solvent properties, coupled with normal temperature, atmospheric CO2 under the gas will be there, it will not be completely cleaned after a residual phenomenon, is a very environmentally friendly dry cleaning process, not only Widely used in various types of industrial cleaning processes, but also can replace the conventional use of toxic organic solvents. Can be used to replace the high-tech telecommunications, optoelectronic semiconductor industry is highly toxic HCFC, or traditional clothing by the dry cleaning industry with high carcinogenic chlorinated solvents (PCE), and a flammable, explosive and cause infertility, and other shortcomings The oil, such as the use of solvents. No need for drying step, the vacuum after the liquid CO2 gas from the surface; are dry-cleaning process. 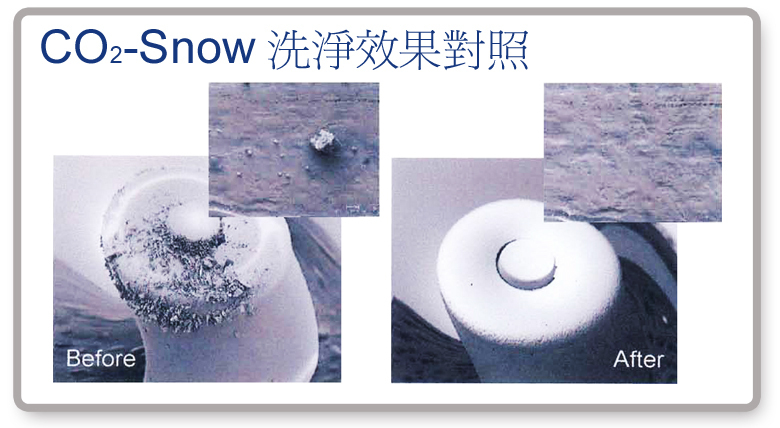 Application of this technology in the solid CO2 is fine particles, such as snowflakes and loose structure of the general, therefore, generally referred to the "CO2-Snow". Mainly in the use of liquid CO2 under the special conditions of adiabatic expansion, with a solid and gaseous CO2 fluid mix of high-speed, high-speed traction fluid of gas and solid-state power CO2 impact of pollutants generated momentum conversion so that the attachment of pollutants from the rapidly Surface to surface to remove the effect of pollutants, to CO2 gas under normal pressure at normal temperature, it will not appear on any part of the residual phenomenon. ※ liquid CO2 soft fine particles, applicable to the impact of intolerance wash, fragile, soft, sophisticated high-tech materials.